The Hun School of Princeton hosted more than forty students from Hun and other schools for a three-day summit exploring how identity impacts both their way of looking at the world as well as how the world views them. 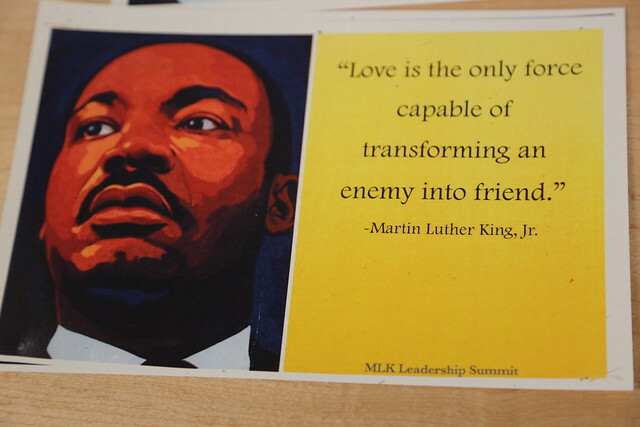 Held January 18—20th, the MLK Summit used a combination of videos, discussion groups, and exercises to explore topics of identity, including gender, race, and sexual orientation. The annual event had eight student facilitators, who had previously participated in the summit, and more than a dozen adults taking part. Topics explored included everything from “redlining,” the practice of refusing mortgages to borrowers who live in poorer neighborhoods, to the concepts of oppression and privilege, to the idea of the “iceberg” personality (that only a portion of our true personalities are revealed to most people.) Summit participants, who were split into smaller discussion groups, also explored techniques for change, such as how to be an ally to someone who is different from yourself, and formulating action projects for their schools and communities. Participants even took a break to build towers out of marshmallows and spaghetti. Each student was given different sizes and types of materials, a metaphor for how different people live life with different resources. Student Milan Moise ’21, said the summit taught her how much she has to learn about issues of equity, social justice, and identity. For example, Milan learned about the issue of gentrification, in which poor neighborhoods are transformed by new property owners, sometimes changing the character of the neighborhood and pricing out current residents. Milan went home and discussed the issue with her mother, who is a realtor.